Dell has been the top computer manufacture for years, though they have never entered the mobile market except to sell other manufactures devices. The Dell Axim X5 is one of the first Pocket PC?s to ever initially retail for under $300 as well as Dell?s entry into the PDA market. The device comes in two flavors, working as both a moderate/high-end product and a low-end. This review looks specifically at the Dell Axim X5 Advance, though Dell also offers a X5 Basic which includes a slower processor, less memory, and a $100 cheaper price tag. 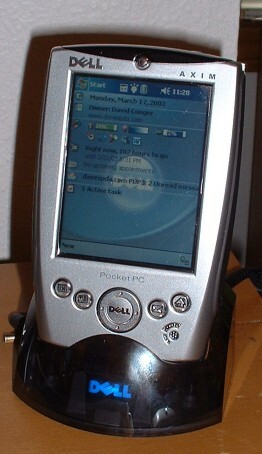 The Dell Axim X5 Advanced uses the Intel XScale PXA250 processor running at 400MHz. The chip has three settings if the user wants to conserve battery life. The processor can be run at 200MHz, 400MHz or can be set to automatically change based on what applications are running. The Axim includes 64MB of RAM, which is plenty of room for a large number of programs and data. The Axim also has a 48MB ROM chip, 22MB of which can be written to by the user. The device utilizes a 16-bit color screen and includes both a CF and SD slot. The Axim X5 Advanced runs Microsoft?s Pocket PC 2002 (built on Windows CE 3) Premium edition with End User Update 3 already installed. The Axim X5 reminds me of my old Philips Nino, though is more stylized and not as rectangular. Its gray/silver plastic shell has black rubber grips on both sides and a black/dark red, semi translucent top. The sides taper in from the devices middle to bottom, conforming to how your had fits around the device. The battery pack stays flush with the backside of the device, except where the devices shell tapers at the bottom. Rubber ?feet? appear on the bottom of the device so it does not shift when set on a flat surface for use. Like most Pocket PC?s, the Axim X5 has seven push buttons and a directional pad (d-pad). The Axim also features a scroll button/switch. The power button appears at the top front face of the device. It is small and is often hard to press. Some users may appreciate the small, hard to press button, but I have found it to be more of a nuisance then a benefit. The power button also has a green and amber light behind it so it can function as the external power connection light, battery alert light, and notification light. Since the button is small it is difficult to tell if the light is lit, flashing, and/or which color it is. On the bottom of the front face are the four standard, programmable buttons of program launching. Two are on either side of the d-pad. Out of the box, the d-pad ?action? press (pushing down on the d-pad) does not function, though Dell has provided a fix for users that want this functionality. The d-pad is small relative to some other devices and provides little feel to the finger as to what part of the pad your finger is on. The final button is on the left side of the device and is another programmable button. By default it is for recording. This button is embedded in the rubber and is extremely hard for me to press with my thumb (which usually lies just over it). The soft reset button is just below the record button, and as usual it must be pressed with the stylus. The scroll toggle on the left side is an nice feature. In many cases, I have found it more useful than using the d-pad for simple up/down actions (like controlling volume in Media Player). Around the same time of the Axim X5?s release, other similarly priced devices were released, though none of them match the expandability of the Axim X5. The Axim includes both a Secure Digital slot (SD) and a Compact Flash (CF) Type II slot. Though the SD slot does not support SDIO cards, the CF slot easily fills in that gap. With memory prices dropping, SD memory cards are incredibly cheap. I picked up a 128mb Lexar card for my Axim, and it worked like a charm as a place for additional storage. Since CF has been around so long, there are a large number of CF expansion card available that support Pocket PC and the Axim. I also picked up an inexpensive Ambicom WiFi card for 802.11b access. Expansion of the Axim is a breeze with what is currently available in SD and CF form-factors. 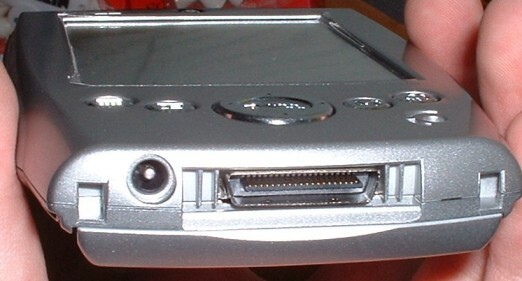 The SD and CF slots were placed in good places on the device. The SD card slot is accessible on the left side of the device, and is spring loaded for easy card removable. The CF slot is right on top, which is very handy for WiFi modules that stick out of the Axim. The CF slot has no eject button, so it is important to put some tape on the top of a card if it does not have a lip on it (so it can be easily removed). Both the Basic and Advanced Axim X5?s include a stylus, though the Basic unit does not include a cradle (only a sync cable). The Advanced includes a sturdy, silver plastic, semi translucent cradle. The cradle connects via USB to a computer for synchronizing and can be connected to the AC adapter so the device can charge while connected. Unlike other cradles, the Axim?s includes an additional slot for a second battery (for charging). The cradle is relatively small so it fits easily on a desk. The included stylus with the Axim is slightly different then some, as it is not completely round but flat. The stylus fits in my hand well, though is simple plastic (like most included styli) and is not adequate for users actively using transcriber or other handwriting recognition software. The Axim includes a removable main battery pack as well as an easily accessible backup battery. The included main battery is 1440mAh. Thus far, the battery life has been incredible. This last weekend I did not even plug it into the charger and the battery is still have 80% (screen at near maximum brightness, SD card always in, WiFi card in sometimes, device used various times through the weekend). Dell offers additional main battery packs for $60 and plans to offer a larger battery pack (3440mAh). 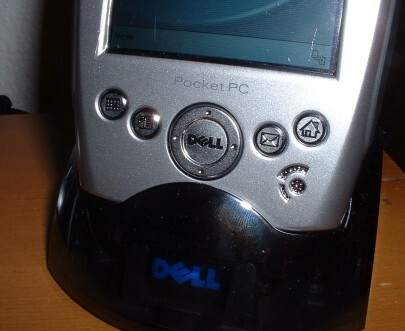 Dell includes some additional software on the Axim, over what Pocket PC 2002 (with EUU 3, including Windows Media Player 8.5) already includes. A ?Switcher Bar? application is included which appears on the top tool bar, and includes an application closer, task switcher, brightness link, and battery life icon. Dell also includes ?Home,? which is an application for program launching similar to how the Palm OS managers programs. Dell made some changes to some of the Pocket PC screens including the brightness control. 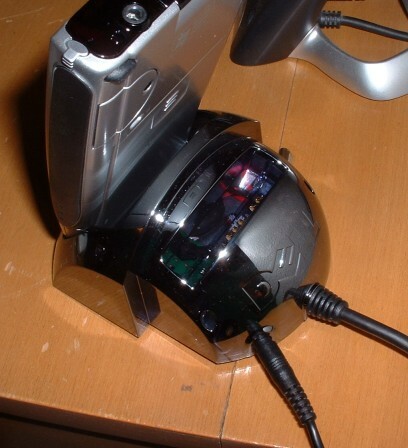 On the Axim device itself, a standard microphone and speaker are included on the front, and an AC adapter port and sync port on the bottom. 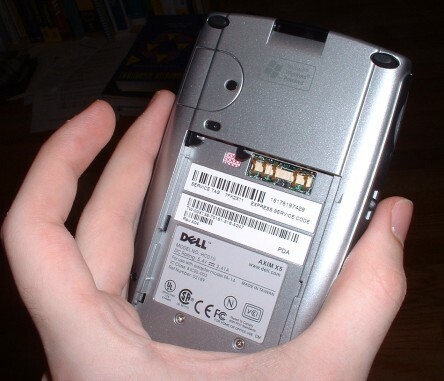 Dell includes a case for the Axim, though it is extremely bulky. 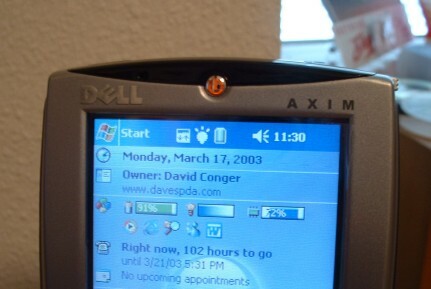 The Dell Axim X5 Advanced has been a great replacement to my Compaq iPAQ 3640. It includes features which I require in a device (large amount of internal memory, multiple expandability options, vibrant screen) and a number of features I have found I really enjoy (removable battery, additional ROM space). Overall, I feel the Axim X5 Advanced is well worth its price tag. It is not only a good device for the new Pocket PC user that is a little unsure of what he or she wants as well as the advanced mobile user that wants a device that doesn?t limit the possibilities for portability and mobility.